With more than 25 years in the field of Adventure Travel. I am now using my knowledge and expertise to periodically bring to you a pick of the best adventure trips being offered in our country. Some of which I do also join. 1.Most likely one I have personally done before or would definitely do. 2.Run by complete professionals who take care of not only the fun and enjoyment, but have a standard and safety record of the highest. 3.Is a trip that will give you the best the area chosen has to offer, with people who are some of the best to explore it with. So here is a magical trip that I highly recommend. Read on and join us. A Zanskar – Ladakh expedition adventure. Its one of the best ways to visit Ladakh. It is certainly not a strenuous trip, and besides being the only way to visit the canyon of the Zanskar, it has great hiking options nearly every day on the trip. We have two departures, so do decide soon on which departure you would like to be on, and revert soonest so we can block space for you.If you are a large group we would suggest take the second dates. Aquaterra Adventures, a leading adventure operator, are pioneers in adventure travel throughout the Indian Himalaya, offering the widest range of adventure travel products, from soft adventure trips to challenging expedition travel. They lay tremendous emphasis on safety, meticulous planning and top-notch guides and equipment. Add to that efficient staff, guides current in First Aid and CPR certification, excellent camp cuisine and an eco-friendly approach to travel. Ladakh lies in the eastern half of the state of Jammu & Kashmir in the far north of India. It shares its much disputed north western border with Pakistan, while to the north lies the Chinese province of Sinkiang, and to the east, Chinese occupied Tibet. It covers an area of approximately 60,000 sq. kms.And ranges from 2600 metres to 7670 metres in elevation, making it the largest and highest district in India. Ladakh is sandwiched between two mountain systems – the Karakorams to the north and the Himalayas in the south. Ladakh can basically be divided into five geographical regions – Central Ladakh(the heartland of the Indus valley), Nubra(lying to the north of the Ladakh range), Rupshu (a dry, high altitude plateau lying in the south-east of Ladakh, Zanskar(one of the highest inhabited regions in the world) and western Ladakh or Lower Ladakh (around Kargil). Ladakh really is a “Little Tibet”. Although Tibet is politically part of China today, Ladakh, like parts of Nepal, is situated on the Tibetan plateau.Ladakh has many Tibetan refugees who fled Tibet with the invasion from China.The daunting height of the Himalaya adds to its isolation, even today the main road routes to Ladakh remain closed for more than six months of each year. Until 1979, there were no regular civilian flights into Ladakh so from October to June the region was completely cut off. Today, it is full of amazing sights – strange gompas perched on soaring hilltops, dwarfed by snow capped mountains, the barren shattered looking landscapes splashed with small, brilliant patches of green and ancient palaces clinging to sheer rock walls. But most of all it is notable for its delightful people – friendly as only Tibetans can be and immensely colorful. We will pass the airport and Spituk gompa on our way, travelling west of Leh towards Kargil. After the army camps, the road rises upto a plateau and passes the diversion to Phiyang gompa. After 36 kms of leaving Leh, we reach Nimu, the confluence of the Zanskar with the Lion river, the Indus. The next 60 kms are a culture vulture’s dream. 06 kms after Nimu we pass the temples and derelict fort at Basgo.Another 10 kms, we reach the painted caves at Saspol. The historic gompa of Alchi is only a 4 km diversion from here. 26 kms further down the road we reach Khalsi where the road crosses the Indus river and slowly winds its way 27 kms upto the beautiful gompa at Lamayuru. On the left, just before reaching the village, there are great views of the ‘moonlands’. We continue climbing for 15 kms upto the highest pass on the route, the Fatu La (13,450ft). After 36 more kms we cross another pass, the Namika La (12,210ft) and then the road descends 15 kms to the village of Mulbekh. Just before the village, there is an ancient 9 metre sculpture of Maitreya, or future Buddha carved into the rock. From Mulbekh, the Wakha river leads upto the cliff face gompa of Gyal. 41 kms further is the town of Kargil which marks the transition to a predominantly Muslim area from where one can either continue west to Kashmir or take the rough road south up the Suru valley into Zanskar, which is our destination. From Kargil, the road runs south upto the Suru valley for 67 kms upto Panikhar. The Balti settlements along this valley are surrounded by lush fields growing a wide variety of crops and fruits ; the villages may seem rather untidy and in a state of disrepair. As we gain height the mighty snow capped peaks of Nun (23,410ft) and Kun (23,220 ft) begin to dominate the view. The road swings to the east for 63 kms, past the last Muslim settlement of Parkachik, to the Buddhist Gelukpa monastery of Rangdum, sitting astride a small hill in the middle of a wide plain. The Pensi La (14,440 ft), which is the entrance to Zanskar is only 20 kms from here. The road descends to the Stod or Doda river which it now follows past the well cared for Zanskari villages to Padum (90 kms), the capital of Zanskar. A little more than a large village, it has a surprisingly large Muslim population, mainly Baltis from the Kargil area, who have settled here since the mid 17th century. Our trip begins in Leh with an early morning scenic flight. On a clear day, you could see as far as K2. We land in very barren landscape as the plane nearly skims the sides of Spituk gompa on one of the most difficult landings in the world. Be prepared to be frisked a lot on this flight – this is a high security flight. Keep a pen and your passports handy – visitor’s registration needed when we land at the airport. Leh, where the altitude of 11,500 feet makes you lightheaded and the simplest chore — climbing a few stairs or struggling with a tight sleeping bag could leave you short of breath. Many people may need up to 24 hours to acclimatize. Headaches and breathlessness usually can be controlled with rest and very light exercise, if any. A three-day ride to the put-in point on the Stod River traverses mile after mile of empty valleys, past millennia-old glaciers and up dizzying mountain passes 14,000 feet high. The Zanskar river trip is graded as being medium difficult, over its 110-mile, six-day white-water rafting expedition. Its scenic beauty and landscape is such that you’d be thrilled to have signed up for this yearly feature. The Zanskar is one of India’s most remote, most isolated and little-traversed rivers. More than half our journey will pass through an otherwise inaccessible gorge, where each bend in the river brings yet another astounding array of color and shape. Water temperatures will vary between 9-11 degrees Celsius.You will be outfitted with wetsuits, booties, gloves, and splash jackets under your lifejackets.The sun is extremely fierce, and large amounts of protective layering, caps, sunshades and sun block are needed. A day on the road will typically begin by 6 am for long 8-9 hour drives with lunch enroute and we will reach Kargil on the first day to have our last shower for nine days.The next two days are over a mainly un-tarred road to the plains of Rangdum and onwards to the put-in at Remala, on the Stod river which meets the Tsarap Chu river downriver of Padum, to form the Zanskar river. At Remala, we say goodbye to our duffel bags and transfer all that we need for the next six nights into large dry bags, to be shared by 2 persons.Pack carefully.We will carry these on rafts till our take out at Nimu. Our trip starts with a safety briefing by your guides – rafts used may be oar / paddle assist or only paddle rafts. The first two days on the river are easy and on the third day, we enter the gorge of the Zanskar, where sheer walls rise 2500-3000 feet above the river. 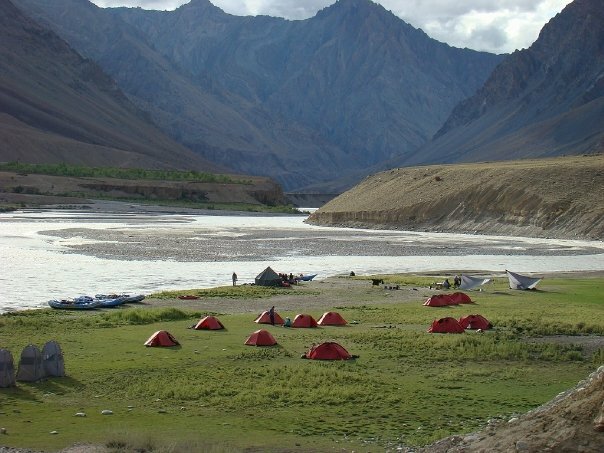 We are on the river for a total of six rafting days plus one day dedicated to a hike into a Zanskar village.A river day begins with breakfast at 7 am by which time; you are expected to vacate your tent so packing can begin. You may help with setting up and packing up of tents. We aim to usually be on river by 9am and reach our camp for the day by 2-3pm, if not earlier. Lunch is usually had on river, and cocktail hour is at sundown each evening. Please remember to carry ample quantities of your favorite poison – there will be no local produce to bank on ! You will sleep inside 4 season tents, which can withstand extreme weather conditions.Karri mats are provided for you to sleep on and are placed under your sleeping bag.If you own a thermorest, please bring it along. Toilets are the great outdoors for most – we also carry toilet tents to use for ladies and whoever may care to give up the joy of having a nicer view. Our crew of guides will also be supplemented by a cooking crew, which would prepare the days meals for the 8 days that we are camping out.Menus vary from Indian fare to Chinese, pasta, cold cuts, sandwiches, eggs etc.. You will be surprised by the variety.We provide you safe drinking water throughout the expedition – we use only the best – KATADYN EXPEDITION water filtration system, which is used by most wilderness expeditions, including those going to Mt. Everest. The entire crew moves together in a totally self-contained manner like a tight knit unit. All food, water and shelter, is carried on rafts and a cataraft.Which is why we need to use discretion while packing – see the packing list. We carry a pretty comprehensive first aid kit on the trip but it will help for you all to carry some easy to access medicine on the trip, for headaches, diarrhea, constipation, and some re-hydration powders like Electral etc. It’s also a good idea to have a roll of toilet paper accessible should you need to go. Our expedition trips are designed for energetic and flexible people who have the spirit of adventure and a positive attitude.Previous experience in the outdoors and camping helps, though is not a must. These trips are participatory in nature, and everyone is expected to pitch in,set up and break down their own tent, clean their own dishes and help with loading and unloading the rafts. Travel to any part ofLadakh deserves a little more respect than many other high altitude destinations because the whole region lies over 2600 meters (8500 ft). People in good health should not get alarmed by this but if you have a medical condition such as high blood pressure, heart or lung disease, you must take the advise of a doctor who has experience with the effects of altitude. We do not take heart or lung patients, or pregnant mothers on this expedition. Any kind of exercise which gets you fitter before this trip is advisable, as it will enable you to enjoy the region more, even though all hikes are optional andthe rafting not of a very strenuous nature. Headache, Nausea & Dizziness, Loss of appetite, Fatigue, Shortness of breath, Disturbed sleep, General feeling of malaise are fairly common symptoms on arrival by air into Leh. These can also be tackled by complete rest on Day 1, sleeping well and drinking lots of fluids (atleast 4-6 litres of the non-alcoholic kind!) and not smoking too much. On all our Ladakh trips till date, nearly all have acclimatised very well and we have had only one instance of a person being in hospital on the first night, on oxygen after which she seemed to have extra bundle of energy throughout the trip. Note: Flights to Leh and back are extremely difficult to book during the season. We normally have an airline block which expires 45 days before the trip date. Should you wish to extend your stay in Leh, please put in a request at the time of booking. Whats Included: all travel from Delhi and back to Delhi by road/ rail / air as applicable (by air and non ac car / jeep / coach), all arrangements for staying and camping while on the trip, accommodation on twin share basis in tents / rest houses / hotels, all meals including those at Leh / Kargil hotels, professional guide fee,all rafting, kayaking and safety equipment with India’s most experienced guiding team, expert leadership, camp staff, cook etc. Whats not :airport transfers in Delhi, any stay and meals in Delhi, bottled water / alcoholic beverages at Leh / Kargil hotels, restaurant meals outside Leh/Kargil hotels, sleeping bag, items of personal clothing,expenses of a personal nature like laundry, phone calls, alcohol, cigarettes, basic medical and evacuation insurance;any costs arisingoutof unforeseen circumstances suchasbadweather, landslides,roadconditions and any other circumstancesbeyondour control. Rates quoted are on twin share. If you prefer single accommodation, the single supplement is Rs. 7500. If you are traveling alone and wish to share accommodation, we will try our best to find you a roommate. If that is not possible, you will need to pay a “forced” single supplement of Rs. 3750. Booking conditions: All bookings are subject to availability of space . We book space on a 100% advance. Ready to go? Email me at pavanemann@gmail.com and I will forward the booking form and payment details to you. IMPORTANT NOTE: AQUATERRA ADVENTURES (I) PVT. LTD.‚ reserves the right to change, alter or cancel a trip due to any reason or extraordinary circumstance like dangerous water levels, landslides, bad weather etc..This right will be exercised in the best interest of your safety, and for the well being of an individual or group of individuals. Temperatures : temperatures on the trip will vary from a maximum of 24 degrees to minimum 10 degrees Celsius. Its best to be prepared for lower temperatures due to wind chill or the weather turning bad.The days are hot and the nights refreshingly cool. What to carry : Keep it light – although what you carry with you is a very personal decision. Some of our guests love to travel as light as possible while others are only happy when they have countless bits of equipment for every possible occurrence, most of which will never be used.The list below covers all essentials that you must carry. A day pack is great to carry things that you will need throughout the day, such as your camera, water bottle, packed lunch, waterproofs, a fleece or a jumper. Good footwear is very important – most trails in Ladakh are pretty rough and steep so a good pair of shoes is important. Sandals work well on the raft (even though you have wetsuit booties as an option) and also for visiting monasteries (where footwear needs to be taken on and off, frequently). Socks, both for walking and a pair of warm ones for keeping feet warm inside the tent at night, is a good bet. Carry any personal medication that you may need, or let us know should you be suffering from any particular ailment. How to carry: Its best to carry your belongings in a large, tough duffel bag or a big rucksack.A bum / waist bag is handy to have your camera, film rolls, flashlights (handy when visiting monasteries) and a guidebook, when you are sightseeing.Pack similar things such as clothes, washing things, camping equipment etc. in separate stuff sacks or polythene bags so they are easier to pull out and add to the waterproofing in your bag. 17. Long trousers / long shirts / Tshirts etc. We provide wetsuits, wet boots, wet gloves and all rafting gear. You live in 4 season tents to withstand weather extremes, if any on the trip.Other items of personal nature need to be added by you especially personal medication, if any. Temperatures are going to vary between 25-30 degrees Celsius to 5-10 degrees at night. Long pants and long shirts are handy because of the strong sun and lots of sun tan lotion. Ginko biloba: Limited studies have been performed, but the results look very promising for prophylaxis of AMS ( 120 mg po BID starting 5 days before ascent, and continuing at altitude. Diamox (acetazolamide) is of some value in the prevention of Acute Mountain Sickness (AMS). Diamox, a drug often used in the treatment of the eye condition glaucoma, is also useful in the prevention of Acute Mountain Sickness (AMS). AMS occurs commonly during visits to 3000-4500m and may cause a severe headache, exhaustion and general feelings of illness. Diamox reduces the headache of AMS and helps the body acclimatise to the lack of oxygen – it also probably reduces the incidence of the complications of AMS. Whether or not one takes Diamox is obviously a matter of personal choice – travel to high altitudes is quite possible without it. Though the drug is not recommended as a routine treatment, though there is variation of opinion about this many people choose to use it if travelling quickly to altitude (eg. if flying into Lhasa, or Leh in our case). Side Effects: Like all drugs, Diamox may have unwanted side effects. Tingling of the fingers, face and feet is the commonest, but this is not a reason for stopping the drug unless the symptoms are intolerable. Dizziness, vomiting, drowsiness, confusion, rashes and more serious allergic reactions have all been reported but are unusual. In exceptional cases, the drug has caused more serious problems with blood formation and/or the kidneys. Those who are allergic to the sulphonamide antibiotics may also be allergic to Diamox. More commonly, the drug makes many people (including me!) feel a little “off colour”; carbonated drinks and beer also taste strange when you are taking Diamox. The town has a wide main bazar street (c1840’s) wide enough to accommodate caravans, with 2 old gates at each end. Leh developed as a trading post and market, attracting a wide variety of merchants – from Yarkhand, Kashgar, Kashmir, Tibet and north India. Tea, salt, household articles, wool and semi-precious stones were all transacted in the market. Buddhism travelled along the Silk Road and the Kashmir and Ladakh feeder. It is an interesting town to walk around. The bazar is colourful and gives an insight in to Ladakhi life. The Old Village, with its maze of narrow lane sits on the hillside below the Palace. A flashlight is recommended especially if you are visiting the gompas. The Palace stands majestically overlooking the town which allowed the king to survey his subjects at all times. (Follow signs for the palace from next to the mosque; it is clearly visible from every house in Leh.) Today it stands empty, as it has since the mid-nineteenth century when the royal family moved to Stok Palace after they were besieged by Kashmiri forces. It was built by King Sengge Namgyal in the seventeenth century in the same style as the Potala Palace of Lhasa. Although not on quite the same scale, it still stands nine storeys high. The upper floors were used by royalty, while the store rooms and stables took up the lower floors, hence the larger windows on the top. There is very little to see in the Palace today as the whole building is in a poor state of repair (be careful of the holes in the floor). Inside, it is like the Potala with numerous rooms, steps and narrow passages lined with old thangkas, paintings, arms and constitutes a museum. The central prayer room, usually locked but opened on request, is unused but has numerous religious texts lining the walls. Currently it is being restored by the Archaeological Survey of India – possible to watch work in progress. (Check up with the Hotel before you leave as to what time it is open for visitors). From the top there are good views across Leh and it’s a fascinating walk through the alleys of the old town to get there. The old town is full of traditional architecture and many households have retained some of their rural values, keeping livestock in their backyards and drying fodder on the roofs. The alternative way up is take the gentle track that begins above the polo ground. From the roof of the palace are magnificent views of the Zanskar Range. High above the Palace is the older and even more ruined Palace/Fort and the remains of the Temple of the Guardian of the Deities. The temple houses a large golden Buddha, many painted scrolls, murals and old manuscripts. The Soma Gompa (1957) (new monastery) in the Old Village was erected to commemorate the 2500th anniversary of the birth of Buddha. Visible from most of the town, this new stupa was officially opened in 1985. The peace pagoda is part of the legacy of the Japanese Fuji Guruji who, as part of his mission to promote world peace through Buddhism, built pagodas and temples all over the world. It stands above Chanspa overlooking Leh and and the Indus Valley. It’s possible to take a taxi all the way to the top but a good test of your acclimatisation is to walk up the 542 steps. The stupa may be a bit garish but the views are spectacular. When you first arrive in Leh and the altitude is making you feel lethargic, go up to the Ecolology Centre one afternoon to watch the excellent one-hour video, Ancient Futures. It’s shown every afternoon at 3:00pm and is free, but be there by 2:30pm to get a good seat. The film provides a valuable insight into the culture of Ladakh and the problems that the region faces today as it struggles to come to terms with recent changes. The centre also has an excellent library, a shop selling locally produced handicrafts and demonstrations of various appropriate technologies such as solar ovens. Located on the east bank of the river Indus, Shey until the 16th centurty was the royal residence, located at an important vantage point in the Indus Valley. Kings of Leh were supposed to be born in the monastery. Shey, along with Thikse, is also regarded as an auspicious place for cremation. The palace sits on a strategic position on a spur jutting out into the Indus Valley. Much of the palace and the fort high above it, has fallen into disrepair though the soot covered wall paintings in the palace have now been restored. The palace gompa has a 12m-high blue haired Maitreya Buddha which is attended by Drukpa monks from Hemis. It is made of copper and brass but splendidly gilded and studded with precious gem stones. The Buddha statue is believed to be sculpted by Nepalese craftsmen. It is said that after its completion they settled in the area of Chilling and started the now famous metal working industry there. There are extensive grounds to the east with a large number of chortens in which cremated ashes of the devout was buried. A newer temple houses another giant Buddha statue. There are several rock carvings; particularly noteworthy is that of five dhyani Buddhas at the bottom of the hill. Situated south of Leh on a crag overlooking the flood plain on the east bank of the Indus, it is one of the most imposing monasteries in Ladakh and was part of the original Gelugpa order in the 15th century. The 12-storey red monastery with typical tapering walls has 10 temples, a nunnery and 60 Lamas in residence whose houses cling to the hillside below. The complex contains numerous stupas, statues, thangkas, wall paintings, swords and a large pillar engraved with the Master’s teachings. The temple on the right of the courtyard houses a 15 metre statue of the Maitreya, or future Buddha which was finished in 1981, while at the back of the Dukhang there is a more than a 500 year old Buddha. the impressive image of Guru Padmasambhava which is in a temple behind the Dukhang (the temple on the right). This huge statue is 12 metres high and was completed in 1984. On the north side are 2 assembly halls approached by a flight of steep steps.The lakhang (chapel) has a 12th century Kashmiri bronze Buddha and silver chortens, an important library of Tibetan style books and an impressive collection of thangkas, the largest of which is displayed every 12 years (last displayed 1992). There are various places where you can eat in the village and also a campground. The gompa at Lamayuru is one of the most immediately striking in Ladakh. Its position on top of a beautifully eroded crag, complete with rock pinnacles and caves, gives it an almost fairy tale quality as it stands over the small village below. There is a local legend that the whole valley was under a deep lake until the holy man, Nimagou, prayed for a monastery to be founded here. With that, the lake drained away. The site of the monastery is probably the oldest in Ladakh with the first temple, like so many others, being built at the time of Rinchen Zangpo. The monastery is officially called Yung-dung Tharpa Ling, or ‘place of freedom’, after it was declared a holy site in the 16th century. It now belongs to the Kagyupa sect. The monastery is situated on a steep mountain overlooking the Padum valley. It was foundedby a translator from Zanskar, Fagspa Sherab and later by Dorjay Sherab and Sherab Zangpo of Stod.It is the largest Gelugpa monastery in Zanskar, with around 90 monks in residence. crossing the Indus just beyond Saspol and doubling back on yourself for about 2km. This entry was posted in Mountain trips and tagged adventure, mountains, special places, travel. Bookmark the permalink.